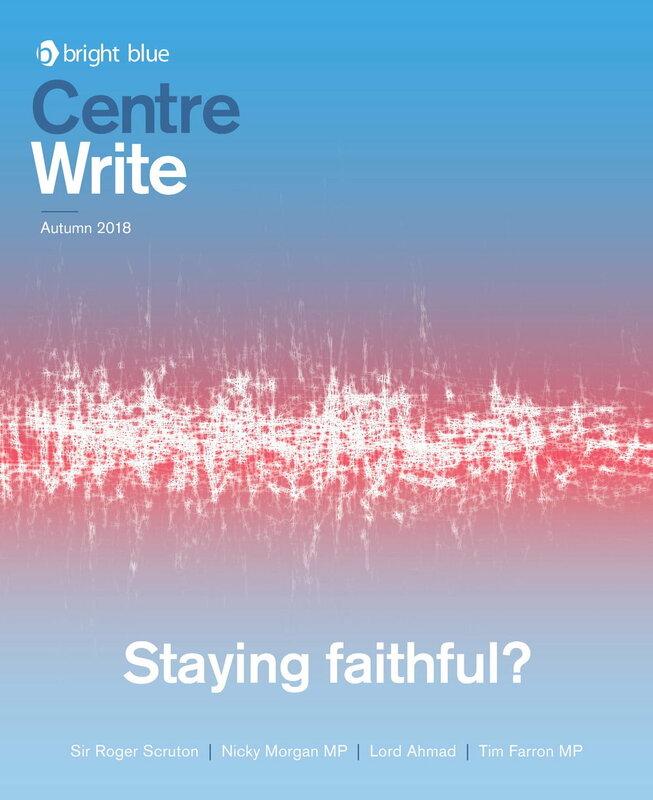 In this edition of Centre Write, we explore the role of religion and faith in modern society. This edition’s interview is with the philosopher, Sir Roger Scruton, who discusses the history and future of the Church of England. The PM’s Special Envoy on Freedom of Religion or Belief, Lord Ahmad, outlines how the UK is seeking to support different religious groups, at home and abroad. The former leader of the Liberal Democrats, Tim Farron MP, identifies the relationship between Christianity and liberalism. Other contributors include Paul Goodman, Nicky Morgan MP and Stephen Pollard. In this edition of the Bright Blue magazine, Centre Write, we explore the ubiquity of mental health problems in the UK and propose solutions for tackling them. Contributors include Tracey Crouch MP, Nimco Ali, Antoinette Sandbach MP and Tim Loughton MP. Our Centre Write interview is with the Minister for Universities and Science, Sam Gyimah MP. The Prime Minister has, from the outset of her premiership, proclaimed her desire to tackle Britain’s ‘burning injustices’. Whilst there has been some early progress, negotiating Brexit has inevitably limited the radicalism of her domestic reform agenda. The outcome of the 2017 General Election, in which the Conservative Party lost its ruling majority, means that backbench parliamentarians are in a uniquely powerful position to influence the current Government. This collection of essays, authored by prominent backbenchers from all the UK’s main national political parties, seeks to highlight some of Britain’s ‘burning injustices’, and provide solutions to help address them. In this edition of Centre Write, we take a deeper look at the opportunities and challenges facing a freshly divorced Britain. Contributors include Tom Tugendhat MP, Baroness Helic, Lord Heseltine, Shanker Singham, Sir Lockwood Smith and Damian Collins MP. Discrimination and the abuse of human rights are immoral, unjust and illegal barriers to individual freedom and flourishing. Tackling them should be at the heart of conservative thinking and policymaking. However, conservatives are often considered to be sceptical of measures to strengthen human rights and tackle discrimination. This polling report unearths in detail what Conservatives - including those from different social groups - really think about the existence of, importance of, and measures on human rights and discrimination. Conservative writers and politicians have been influential in the development of human rights in the UK for centuries. Sir Winston Churchill made the enthronement of human rights a war aim, which was achieved by the founding of the European Convention on Human Rights (ECHR). It was a Conservative MP in 1968 who was the first to campaign for incorporating the ECHR into UK statute law, which would eventually be realised with the introduction of the Human Rights Act (HRA) 1998. However, Conservatives today are sceptical of the HRA. The current Government has promised to review the UK’s future human rights legal framework after Brexit. This report, written by Sir Michael Tugendhat, outlines and assesses different options for reform, concluding that Conservatives should be supporters of the HRA and ECHR. Britain is the home of human rights and a global force for good. After Brexit, Britain should not just be a global leader in free trade, but in human rights too. In this country, as a result of discrimination, too many people are still held back — especially in education and employment — because of who they are rather than what they do. After a year-long inquiry led by a commission of high-profile decision makers and opinion formers, this report provides a comprehensive and compelling set of policies which can be used by the current Government for its social reform agenda to strengthen human rights and tackle all forms of discrimination. With the launch of the Casey Review this month sparking fresh debate about the state of integration in the UK, this new report brings together leading decision makers and opinion formers from different political and professional backgrounds to argue that integration should be a top priority that unites both Left and Right. The collection, published by Bright Blue, brings together leading thinkers, decision makers and public figures to discuss three key themes in the debate around human rights: tackling discrimination; the role of human rights in British foreign policy; and ensuring the new British Bill of Rights strengthens human rights.